This simple stone belongs to John A. Benson, the father-in-law of the sister of my great-great-grandmother, Emma Sophia (Tock) Shinn. The story of John A. Benson is an interesting one with a sad ending. John was born in North Carolina to unknown parents. He moved to Missouri at some point and married Missourian Edna Kimzey/Kimsey. In the late 1840s the family moved to Oregon for a few years then the family moved to San Joaquin Co., California and established Benson's Ferry in 1850. 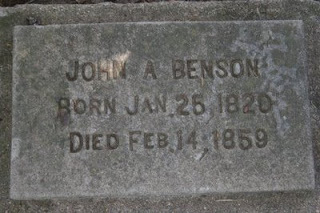 On Valentine's Day in 1859, John A. Benson was murdered and later buried in the Sacramento City Cemetery. Several of John's family members are buried around him, including my relative and his daughter-in-law, Martha Ann (Tock) Benson. Benson, a leading citizen of the San Joaquin area in the 1850s, apparently was a bit of a braggart with a blue streak. He openly talked about taking liberties with the wife of his employee , Green C. Palmer and it all came to a head when Benson gave Palmer's children some sweets and snacks. Palmer, enraged already by the rumors going around about Benson and Palmer's wife perceived the trivial treats as the final straw in Benson's theft of his family and embarrassment of Palmer. What follows is an excerpt from the book History of San Joaquin County, California with Biographical Sketches: Turning Benson saw Palmer running towards him with a revolver in his hand; surmising Palmer's intentions Benson cried out, "Don't, Green," but the murderer exclaimed, "There, you ----- scoundrel you disgraced my children and now you must die," Palmer fired twice in rapid succession each shot hit Benson in a vital spot and he died while being conveyed to the house in a wagon. Palmer returned to the house, reloaded his revolver and started on a run for the tules. He was not pursued and the following day Andrew Benson, the brother of the victim, offered a reward of $300 through the newspaper for his arrest. The fugitive was discovered about sunrise by a vaquero who was looking for some lost horses. Palmer was shaking and shivering with cold and hunger, having had nothing to eat since the murder. He gave himself up and taken to Stockton, was brought before Justice McCausland and remanded to jail. He there remained until the meeting of the grand jury in May. He was then indicted on the charge of murder and the trial took place August 4, 1859. There was considerable excitement and the court room was crowded, for each man had many friends. Money was freely spent by Benson's friends and they employed E. D. Baker, the most brilliant orator and attorney in California, to assist the prosecuting attorney, Judge Campbell. Samuel A. Booker defended Palmer. The trial looked crooked from beginning to end. The prosecution put on one witness only, Dr. Hogaboom; the defense five witnesses to prove Palmer's charge. It was one of the shortest murder trials on record. At five o'clock Attorney Booker began his closing speech, ending at eight o'clock. Baker closed at 9:30, and Judge Creanor, delivering his charge, the jury were locked up for the night. Twenty-four hours later they were discharged unable to agree, the jury standing five for murder in the first degree, which meant death by hanging; five for murder in the second degree, and two for acquittal. The second trial took place December 12, with J. G. Jenkins and Judge Campbell for the prosecution and S. A. Booker for the defense. The case was given to the jury at 7:30 and at 1 o'clock the following day they were discharged, nine for acquittal and three for manslaughter. In the third trial, January 3, 1860, the defense found some new witnesses. They proved to be good ones, for the jury brought in a verdict not guilty. After the acquittal Palmer's conscience must have greatly worried him, for on January 26, while in Mokelumne City, he committed suicide by taking strychnine. His friend, J. H. Veach, running into the house at Mrs. Palmer's call, exclaimed, "Why have you done this?" And like old Adam in the Garden of Eden he replied, "This woman is the cause of all my trouble. I wish to die and get out of my misery." 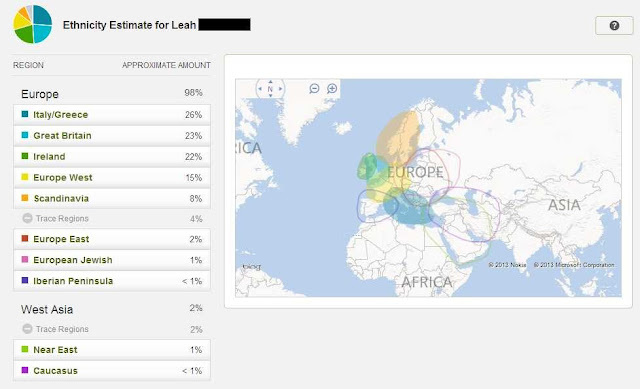 Oh my goodness, Leah! That's an awesome story. I'm glad you posted it and I'm glad I'm following you so I got to read it! Saturday Night Fun- Who's Number 21? "Guardian of the Golden Gate"